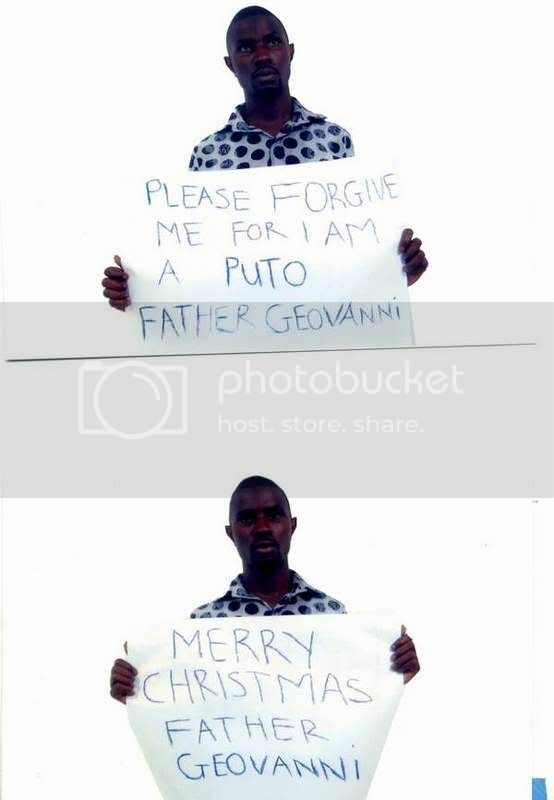 After he sent Father Geovanni the photo. The right thing to do was to send him the payment. I have attached the receipt one more time for you. All the other information is there. God Bless you my son. I will be contacting you to send you scholarship funds for your school. I did not know WU called the FBI to confirm about blurred WU forms. I am sure the WU receipts are perfect. The Lads just suffer from a near-sighted condition. Obviously, your Lads are in dire need of optical care. Perhaps they could be recruited to open up church eye care centres that specialize in obtaining corrective lenses for the reading of the WU receipts. They are just brilliant in there attempts. If I had just written an abusive comment and then decided that it wasn't appropriate I'm pretty sure most normal people would delete it before continuing with a request for money. upset due to the fact that your friend Ghetoo sent me a letter. I dont appreciate a letter with a heading calling me a lier. This is his heading of the letter he sent. All you had to do was just send me a letter explaining the problem. I have solved the problem why the receipt was blurred. I should not even send you any money but God will punish me if I dont. May God forgive you for your sins. A few hours later I received another letter from my mugu pretending to be in jai. I am sorry to hear that you are in jail. You sound confusing. First you tell me that you dont need the money and yet you want me to send you the information. I have told you I am still very, very hurt by you and your friend. Like I said before I will not send you the information because of what you did. So tell your good friend that he has to send me the photos. I have the money for you and your friend. As soon as you or your friend sends me the photos I will send the money. True friends will make a sacrifices to help his friends. Any way my son, I think that it is very nice and modern that the jails in your country have computer rights for the individuals detained. God bless you my son. have gone to me the information in a text kind. MTCN (Money Control Transfer Number). Jack have gone to me a new copy of the receipt and the information as soon as possible. Hello Jack. you have received my message? Why you do not write to me? I opened the picture of the receipt fine on my computer. What software are you using? Is it adobe? I'll send the picture again. Great stuff rumbero. I'm laughing my *** off! Even our jail doesn't have internet access. (Not that I would know, or anything, or, well, you know. It was on a school field trip, or something, I think). ^^^^ I am just waiting to see how loyal mugus are to each other. I hope to get my new trophies out of his dumb mistakes. The blurred WU reciept is indeed awesome, but I usually take it a step further. First I send them a "writejunk" file which they can't seem to open. That goes back and forth a couple of times before I go to the blurred WU reciept. The closer it gets to Christmas, the more frantic they become......... Should I be enjoying this so much?????? ^^^^^ No, you should not be enjoying what you are doing. It is the season to be jolly. And a be nice to your mugu week. How are you doing in Jail. I hope they are treating you fine. When will you be getting out of jail ? The good thing about your jails in your country is that you have internet access. Here in my country they don't. I will be sending a letter to the Governor so they can install this great service also here. Any way, I have not heard from you or your friend Ghetto about sending me the pictures. Son It is real sad to find out who your true friends are. It is apparent that your friend has no compasion for you and would rather see you stay in jail then to help you. and what you have to do in order to obtain the money and get out of jail. please let him know that he too will get some money. To my surprise I did get a letter from the police station. Should the priest save his life and tell the officer he is ok, but not provide the mtcn number ? Should I let him rot in jail ? Should I demand the requested photo of him ? Yes....by all means....ask for the photo behind bars! Do what a real priest would do: tell him you feel very sorry for him and Christ alone is his salvation. Amen. ^^Absolutely! KD hit it right on the money. And a mugu in jail is worth a 1000 mugus in a cyber cafe! Perform the last rights on your Lad. BUT GET THE PHOTO OF HIM BEHIND BARS FIRST! Send a made up 10 digit control number to the police. Maybe you can get the policeman arrested for being a "scammer/fraudster." Well I am greedy and will try to kill two birds with one stone. I gave it some good thought on how to trap the police(Scammer) and my mugu. This letter is to confirm that Mr. Ikem Michael is a member of the Save the World Church. Sir, I need to verify that indeed he is detained in jail. members that took the Holy induction ceremory performed to our late and departed Father Thomas Chingon. simple photograph of themselves to prove that they indeed had taken the induction ceremony. Mr. Ikem and Ghetoo insulted the good name of the Save the World Church and called me names. This made me angry and very upset over the idea that I, a man of the cloth, a servant of God was a cheat. and his friend who apparently did not care to much about Ikem beign in jai. I will release the wire information to you only if Ikem sends me the required photo or you send a photo of Ikem in jail. The other way to verify is for you to send me a photo holding a large sign that reads the following. Please let me know also how much it will cost to get Ikem out of jail. Sir, let me make very well aware that, I wont be paying any monies until I get photo evidence of you or Ikem. I think I'd tell him you won't give any information (like website) because you (or your organization) , might be caught up in an investgation. THEN ask for the name of a good barrister... or make up a barrister from the area. You could forward "barrister" emails to the "investigator". I would like to thank you very much for your quick reply. I am also glad that you were able to convince Ikem to send the photos. Inspector Mike, I am sending you my personal number. Please dont give it to anyone. Have your heard of Ghetoo. He is another member who has not been paid by the church. I am just trying to verify his induction. It is apparent that he might be a fraudster. He sent me a letter with storn insults to me. You see, After the church of Light Eternal burnt down, all records that Father Thomas Chingon had on the new members that took the holy induction ceremony were destroyed. I have headaches trying to find these members so they can get paid. I have to find approximately 8 members who I have not been able to find. I have been able t find 10 only this is including Ikem. he had mentioned that he knew of other members but has kept this from me. If you could dome a favor an threaten Ikem that he will be spending a year in jail if he does not send me the names. It would really be appreciated. The verification of these members is very easy. I just need a photo from them if order to justify the donations to the goverment for tax peruposes. I have to have all this before the end of the year. Question: Does every church that you know of have a website ? ceremony, and has lied to the inspector. Question here is. Should I bring my other church that has a website to bouch for me? or just simply tell him I don't have a website? Please you can make a new copy, with a size about 1 Mb. If your lad's unhappy about the size of the image, here's a 1mb version of the blurred westie slip. Was this a bit too much ? First of all I would like to wish you a Merry Christmas's and your family. Wishing you the best and may the new year bring you health and joy. I feel sorry for Ikem and all the other inmates for spending x-ams in jail. one morning that he found Vaseline on him. After all this matter is resolved. I don't know why Ikem said that the Holy induction ceremony was awful. That is a lie. Our church does not have a website. Here in the US, not all the churches have a website. my friend and an outstanding member of the community. of making the church forms and certificates of membership to our members. save the lives of others. Please make sure that Ikem is well taken care of. The good police inspector let him out to take this pic.